A visit to Kununurra will give you a true sense of the pioneering Australia spirit and the nomadic life. Escape the urban bustle at Ord River and El Questro Wilderness Park. Your cultural itinerary includes sights like Zebra Rock Gallery and Artopia Kununurra. Change things up with a short trip to Five Rivers Lookout in Wyndham (about 1h 35 min away). Spend the 14th (Tue) exploring nature at Mirima National Park. Spend the 17th (Fri) exploring nature at Mitchell River National Park. Next up on the itinerary: explore the stunning scenery at Emma Gorge, view the masterpieces at Artlandish Aboriginal Art Gallery, identify plant and animal life at Parry Lagoons Nature Reserve, and admire all the interesting features of ZEBRA ROCK MINE GALLERY & CAMPGROUND. To find maps and other tourist information, read Kununurra trip itinerary builder app . Melbourne to Kununurra is an approximately 9.5-hour flight. You can also drive; or take a bus. Due to the time zone difference, you'll gain 2 hours traveling from Melbourne to Kununurra. While traveling from Melbourne, expect warmer days and somewhat warmer nights in Kununurra, ranging from highs of 36°C to lows of 16°C. 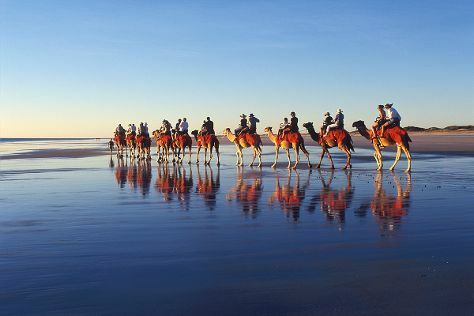 Cap off your sightseeing on the 17th (Fri) early enough to travel to Broome. Relax by the water at Cable Beach and Reddell Beach. Do some cultural sightseeing at Broome Historical Museum and The Courthouse Collection. Spend the 19th (Sun) wandering through the wild on a nature and wildlife tour. And it doesn't end there: explore the striking landscape at Gantheaume Point, look for all kinds of wild species at Broome Bird Observatory, tour the pleasant surroundings at Broome Town Beach, and explore the different monuments and memorials at Japanese Cemetery. For photos, maps, more things to do, and other tourist information, you can read our Broome trip planner. Getting from Kununurra to Broome by flight takes about 1.5 hours. Other options: drive; or take a bus. In July in Broome, expect temperatures between 35°C during the day and 17°C at night. Finish your sightseeing early on the 24th (Fri) so you can travel to Derby. Derby is a town in the Kimberley region of Western Australia. On the 25th (Sat), admire the masterpieces at Norval Gallery, don't miss a visit to Boab Prison Tree, then browse the exhibits of Mowanjum Art and Culture Centre, and finally contemplate the waterfront views at Manning Gorge. To find reviews, traveler tips, more things to do, and more tourist information, use the Derby road trip planning app . Traveling by car from Broome to Derby takes 2.5 hours. Expect a daytime high around 36°C in July, and nighttime lows around 18°C. Finish your sightseeing early on the 25th (Sat) to allow enough time to travel to Exmouth. Exmouth is a town on the tip of the North West Cape in Western Australia. Get in touch with nature at Turquoise Bay and Ningaloo Coast World Heritage Area. You'll get in some beach time at Osprey Bay and Wobiri Beach. Go for a jaunt from Exmouth to Coral Bay to see Ningaloo Marine Park about 52 minutes away. Spend the 29th (Wed) exploring nature at Mandu Mandu Gorge. And it doesn't end there: take a tour by water with Boat Tours & Water Sports, take in the awesome beauty at Shothole Canyon, enjoy the sea views from Vlamingh Head Lighthouse, and see the vivid underwater world at Ningaloo Reef. For reviews, ratings, where to stay, and more tourist information, go to the Exmouth sightseeing planner. You can drive from Derby to Exmouth in 16 hours. Another option is to fly. Plan for a bit cooler temperatures traveling from Derby in July, with highs in Exmouth at 28°C and lows at 13°C. Finish up your sightseeing early on the 1st (Sat) so you can go by car to Denham. Denham is the administrative town for the Shire of Shark Bay, Western Australia. Escape the urban bustle at Shark Bay and Francois Peron National Park. Relax by the water at Shell Beach and Little Lagoon. 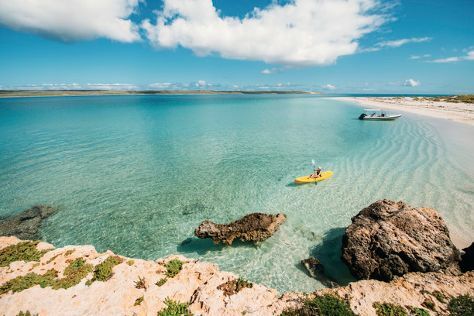 And it doesn't end there: explore the striking landscape at Hamelin Pool Stromatolites, wander the streets of Shark Bay Car Hire, meet the residents at Ocean Park Aquarium, and take some stellar pictures from Eagle Bluff. For ratings, more things to do, traveler tips, and tourist information, refer to the Denham driving holiday planner. Traveling by car from Exmouth to Denham takes 8 hours. Alternatively, you can do a combination of bus and car; or fly. Finish up your sightseeing early on the 5th (Wed) so you can go by car to Geraldton. Geraldton is a coastal city in the Mid West region of Western Australia, located 424km north of Perth.At June 2015 Geraldton had an estimated urban population of 39,825. Get a sense of the local culture at HMAS Sydney II Memorial and The Tin Heads. Relax by the water at Pot Alley Beach and Chinaman's Beach. Explore Geraldton's surroundings by going to Oakabella Homestead, Tea Rooms and Campground (in Northampton) and Kalbarri (Meanarra Hill Lookout, Red Bluff, & more). There's still lots to do: get engrossed in the history at Museum of Geraldton, make a trip to Monsignor Hawes Heritage Centre, admire the natural beauty at Greenough Museum & Gardens, and identify plant and animal life at Coalseam Conservation Park. To see other places to visit, traveler tips, ratings, and other tourist information, go to the Geraldton journey maker . You can drive from Denham to Geraldton in 5 hours. Alternatively, you can do a combination of shuttle and bus. Expect a daytime high around 24°C in August, and nighttime lows around 9°C. Cap off your sightseeing on the 10th (Mon) early enough to travel to Fremantle. Settled by colonists and convicts in 1829, Fremantle has transformed its infamous historical buildings into cultural centers. 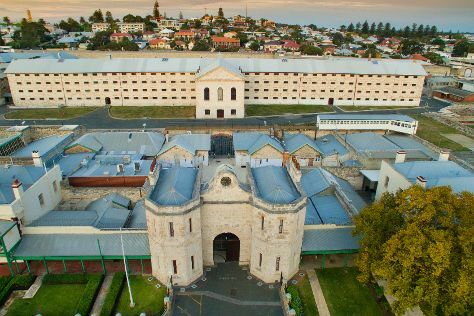 Do some cultural sightseeing at Fremantle Prison and The Perth Mint. Visiting Cottesloe Beach and Scarborough Beach will get you outdoors. Explore Fremantle's surroundings by going to Caversham Wildlife Park (in Whiteman), Dolphin & Whale Watching (in Mandurah) and Perth (Kings Park & Botanic Garden, Art Gallery of Western Australia, & more). Next up on the itinerary: learn about wildlife with up-close encounters at Perth Zoo, do a tasting at Tyler's Vineyard, take in the architecture and atmosphere at St John's Anglican Church, Fremantle, and pause for some photo ops at Kings Park War Memorial. To see reviews, traveler tips, other places to visit, and other tourist information, refer to the Fremantle travel itinerary planner . Traveling by flight from Geraldton to Fremantle takes 4 hours. Alternatively, you can drive; or take a bus. August in Fremantle sees daily highs of 22°C and lows of 9°C at night. Finish your sightseeing early on the 16th (Sun) to allow enough time to drive to Margaret River. Your itinerary includes some good beach time at Meelup Beach and Margaret River Mouth Beach. Escape the urban bustle at Lake Cave and Cowaramup Bay. Explore the numerous day-trip ideas around Margaret River: Busselton (Dolphin & Whale Watching & Busselton Jetty), Barrecas Winery (in Donnybrook) and Mongrel Creek Wines (in Dunsborough). There's lots more to do: awaken your taste buds at some of the top wineries in the area, learn about winemaking at Happs Winery and Cellar Door, indulge in some culinary diversions at a local gastronomic tour, and explore the fascinating underground world of Jewel Cave. To see photos, ratings, more things to do, and tourist information, use the Margaret River road trip planning site . You can drive from Fremantle to Margaret River in 3 hours. Alternatively, you can take a bus; or do a combination of train and bus. Finish up your sightseeing early on the 24th (Mon) so you can go by car to Albany. You'll enjoy a bit of beach vacationing at Greens Pool and Middleton Beach. Step out of the city life by going to Dolphin & Whale Watching and Elephant Rocks. Change things up with these side-trips from Albany: Devils Slide (in Porongurup National Park), Denmark (Singlefile Wines, Forest Hill Vineyard, & more) and Duke's Vineyard (in Porongurup). There's much more to do: see the interesting displays at National Anzac Centre, take some stellar pictures from Padre White Lookout, get engrossed in the history at Albany's Historic Whaling Station, and pause for some serene contemplation at The Church of Saint John the Evangelist. To see ratings, traveler tips, reviews, and other tourist information, read Albany online route planner . Getting from Margaret River to Albany by car takes about 4.5 hours. Other options: take a bus; or do a combination of bus and flight. Expect a daytime high around 19°C in August, and nighttime lows around 7°C. Finish your sightseeing early on the 31st (Mon) to allow enough time to travel to Hyden. The town of Hyden is located 292 km east-southeast of Perth, Western Australia in the Shire of Kondinin. On the 1st (Tue), take in the dramatic natural features at Jilakin Rock, then explore the striking landscape at Wave Rock, and then take a leisurely stroll along Lake Magic. On the 2nd (Wed), you'll have a packed day of sightseeing: pause for some photo ops at Scrap Iron Sculptures, see the interesting displays at The Lace Place, then explore the striking landscape at Hippo's Yawn, and finally Head underground at Mulka's Cave. To see reviews, traveler tips, and more tourist information, read Hyden attractions planner . Traveling by car from Albany to Hyden takes 4 hours. Alternatively, you can fly. Finish your sightseeing early on the 2nd (Wed) so you can travel to Esperance. Esperance is a town in the Goldfields-Esperance region of Western Australia, on the Southern Ocean coastline approximately 720km east-southeast of the state capital, Perth. Escape the urban bustle at Cape Le Grand National Park and Frenchman's Peak. Visit Twilight Bay and Lucky Bay for some beach relaxation. 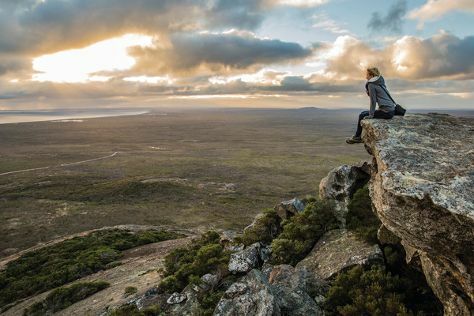 Spend the 6th (Sun) exploring nature at Cape Arid National Park. There's much more to do: explore and take pictures at Great Ocean Drive, head off the coast to Woody Island, steep yourself in history at Esperance Stonehenge, and tour the pleasant surroundings at Rotary Lookout. To find traveler tips, where to stay, reviews, and more tourist information, read our Esperance road trip planning site . You can drive from Hyden to Esperance in 4 hours. Another option is to fly. In September, plan for daily highs up to 22°C, and evening lows to 9°C. Wrap up your sightseeing by early afternoon on the 9th (Wed) to allow time for travel back home.